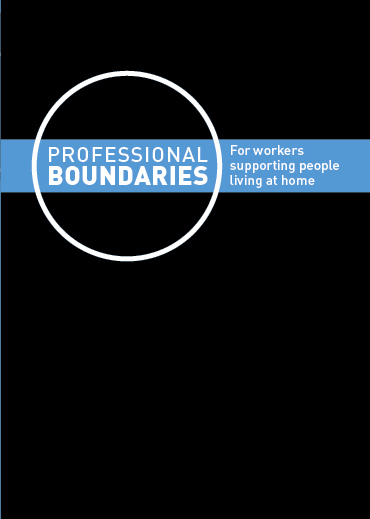 The Professional Boundaries video gives an overview of what a professional boundary is, then eight real work scenarios which show where a boundary could be crossed between a worker and a client. Working through the scenarios will help workers to be clear about their role – what they are there to do and what they are not there to do. It will assist them in saying “no” and to explain “why” to the client if they ask them to do something that is not on their task list. To see a preview of the Professional Boundaries video and more information click here. Ideas That Work has now produced 21 Community and Aged Services training videos that are available as DVDs or streaming video. See the Ideas That Work video price list for DVD and streaming prices of individual videos. With streaming video you create an online account, subscribe to a video and watch it straight away. You can stream it to your computer or mobile devices such as your smartphone or tablet. It gives you access to training videos anywhere, anytime. A 12 month subscription gives you unlimited views for the subscription period. You can also share the video with your team/students via a private link so they can watch the video on their own computer or mobile device. The 12 Months PRO subscription gives you all the benefits of the 12 month subscription PLUS the added feature of being able to embed the video into your learning management system, intranet or private website for the length of your PRO subscription. This means the video plays within your online training program without students having to leave the page and log in elsewhere to view it. Now you can also purchase a 24 hour subscription for $5.95 to have immediate short term access to any of our videos so you can check that the video suits your training needs. NOTE: The 24 hour streaming subscription is for preview only and cannot be shared with others or used for training. If you want to know more about Ideas That Work streaming videos then check out the FAQs. If you cannot find the answer to your query in the FAQs then email us at info@ideasthatwork.com.au or call us on 03 9525 1407. Get high quality training videos for Community and Aged Services, Business and Industry which you can watch online or on DVD.